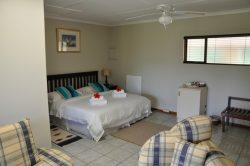 Hildesheim Guest House offers 4 bed and breakfast suites. 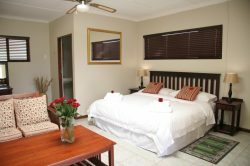 Two Garden Suites that sleep 2 guests, a Family Suite next to the Pool that sleeps 4 and our Honeymoon Suite that is also located next to the Pool and has beautiful views over the Pool and Outeniqua Mountains. Garden Suite 1 offers Twin beds or a King size bed . The bathroom has a shower only. Enjoy the atmosphere from your private deck overlooking the Outeniqua Mountains. Garden Suite 2 offers Twin beds or a King size bed . The bathroom has a bath with shower over the bath. Enjoy the atmosphere from your private deck overlooking the Outeniqua Mountains. 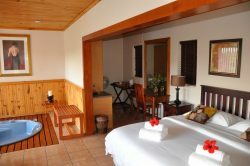 Pool Side Family Suite – The suite comprises two bedrooms with king beds and two bathrooms . 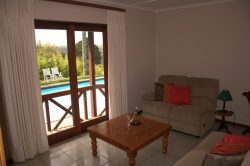 The suite also has a private lounge overlooking the pool and the Outeniqua Mountains. The Honeymoon Suite located next to the pool with lovely Outeniqua Mountain views from a King size bed. The en-suite bathroom has a shower and the suite has a separate Spa bath. As far back as the late 1800's the reputation of Wilderness with its natural bounty of rivers and lakes and intrinsic peace and tranquillity, ideal for seaside holidays, was established in a little stone farmhouse. A seaside boarding house was established in the old homestead - and so began the tradition of hospitality which has made this small resort town famous all over the world. The romantic resort of Wilderness lies 15 km east of George, between the Kaaimans River in the West and the Goukamma Nature Reserve in the east, bordered by the Outeniqua Mountains in the north and the Indian Ocean in the south. Wilderness is renowned for its vast stretches of beach, its peace and tranquillity and the absence of windswept headlands and wild, stormy seas. The long stretch of beach embraces the mouths of the Touw and Kaaimans Rivers, and is backed by northward cliffs over which the fringe of the forest reaches down to sea level. Wilderness not only overlooks the sea, but also the placid lagoon (Touw River Estuary), the Serpentine, which meanders between the Touw River, Island Lake and Rondevlei. This is a favourite venue for waterskiing and attracts enthusiasts from far and wide. Recreational activities in Wilderness include hiking, mountain-biking, bird- and whale-watching, hang- and paragliding, horseriding, scenic drives, day tours, angling, boating and other water sports.